We would greatly appreciate if you are interested in participating with an artist profile in '100 ARTISTS TO KNOW' that a new Masters of Today (MOT) art book project for contemporary artists, art galleries and art museums, to get on the most research-driven list of the worlds best active collectors and others who uses Masters of Today (MOT) art books series to permanent collect and review contemporary art. Ensure that you're sending your most iconic works of art. • up to 40 works: 300 dpi/ 23 cm/ 9 in JPG /TIFFs files. Hardcover 24x24 cm | 9,5x9,5 inched, up to 300 pages, museum quality offset printed on 200 grams art paper. The first print run 25,000 copies. The book electronic version /eBook is provided by email to our over 120,000 art art resources and subscribers. Who are using Masters of Today (MOT) and World Of Art (WOA) publications are also used by leading art museums, art biennials, cultural centres, art fairs, curators including among others: The Museum of Modern Art New York; The Guggenheim Museums in New York, Las Vegas, Bilbao, Berlin and Venice; Museum Ludwig, Cologne, Germany; TATE Modern and TATE Britain United Kingdom; Moderna Museet Stockholm, Sweden; Castello di Rivoli Museo d’Arte Contemporanea, Torino, Italy; ARC /Musée d’Art Moderne de la Ville de Paris, France, are also used bySTARKE Foundation Germany; Venice Biennial; Manifesta; Art Basel, Art Forum and many others worldwide. We specialize in collectible, collective, museum quality art books and individual numbered and signed bibliophile limited editions art books. Our clients are fine artists, art museums and art galleries worldwide. 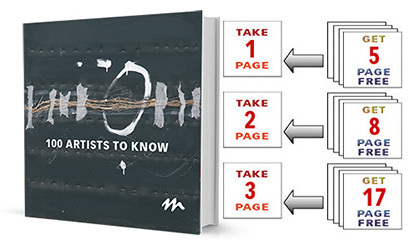 All Masters of Today (MOT) art projects represent the values of an art object professional in every aspect, unique created publications for collectors, galleries, museums, bookstores, libraries and art lovers, an overview of our contemporary art.